In previous articles, I discussed many Best Vietnamese Food of Phú Yên province. Today I introduce about one Traditional Vietnamese Food of this province. It is green rice flake cake. This traditional Vietnamese food is well known as the specialty food of Phong Hậu Village. Phong Hậu green rice flake cake is not similar with Northern green rice flake cake. 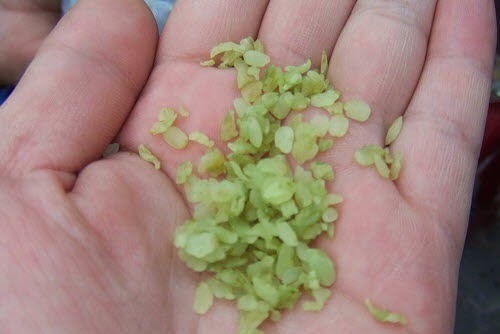 Green rice flake cake of Northern area is made by young sticky rice and packed by lotus leaves. 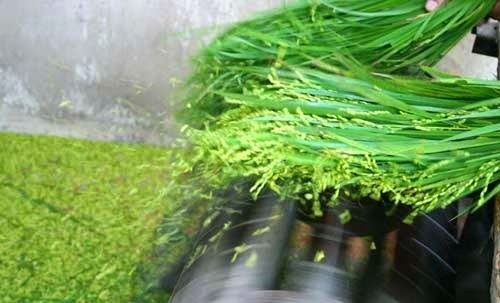 Phong Hâu green rice flake cake is made by old sticky rice. To make this Traditional Vietnamese Food, people have to roast the sticky rice firstly and then take the crust away. Next, roast the sugar and then put the sticky rice into the shaped box. When the sticky rice is tied, take the shaped box out and spread some flour to make it tied and preserved. To make this food is delicious, you have to focus on roast sticky rice and roast sugar. If you roast the sticky rice too much, the cake will turn to yellow. In case of roasting the sugar too much, the cake is easy ruined. Therefore, you need to be careful when roasting two steps. The two steps above are just two simple step of making green rice flake cake – one of Traditional Vietnamese Food. There is one secret and difficult step to make it and the local people do not release it. To have a luscious cake, it has to be packed by banana leaves and then tied by wire strips. The banana leaves uses to avoid the temperature and wet of the weather. In the morning, it is really interesting when enjoy the green rice flake cake with one hot cup of tea. Besides of having many best Vietnamese Foods, Phú Yên has one delightful Traditional Vietnamese Food. Make sure that you already take note about this dish before planning to visit Vietnam Hope you have an exciting trip with family and friends in my beautiful Vietnam. See you soon.